SC2 Supply Chain Services & Solutions is a third-party logistics company that has provided supply chain solutions and services to OEMs and Tier 1 and Tier 2 manufacturers in a range of industries for more than 30 years. It has 15 locations in Illinois and Texas and approximately 2,000 employees, and has been 100 percent employee-owned since 1988. SC2’s large range of services includes fabrication, industrial painting and finishing, kitting and sub-assembly, packaging, warehousing, transportation, filtration products and services, and reverse logistics. 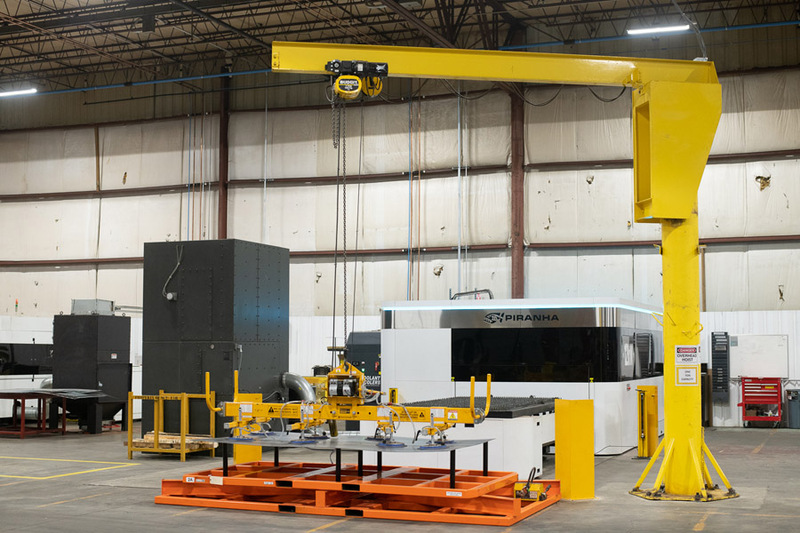 To provide the flexibility needed to produce parts from small components to large shipping racks, SC2 has flat laser cutters, multiple weld bays and a state-of-the-art tube laser that cuts 8.5 in. round, 6 in. square and up to ¾ in. material thickness. In addition to tube, it can cut open geometries such as angle, channel and I-beam. Forming services include press brakes that range from 35 tons to 500 tons. SC2’s machine shop consists of Bridgeports, lathes, grinders and bandsaws to support production. Part of maintaining success for more than a quarter century requires investments in the latest technology, techniques and people to ensure excellence in quality and efficient delivery every time. 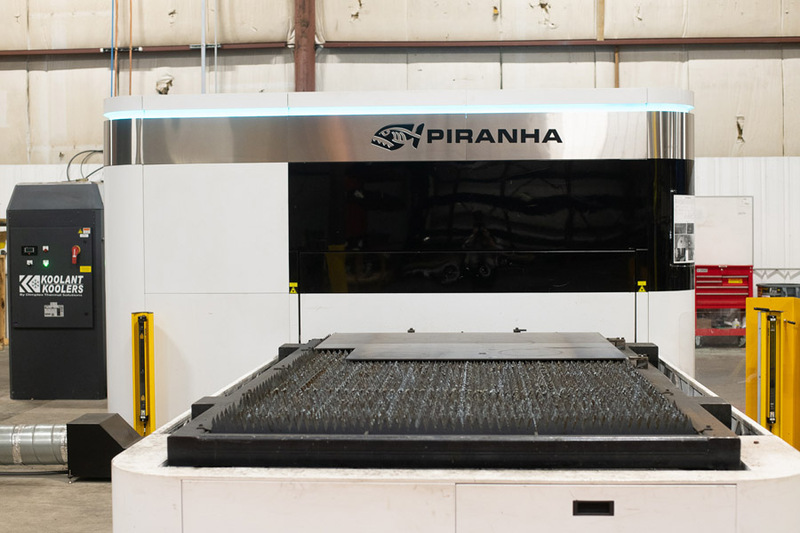 Just this year, SC2’s Fabrication Division purchased a Piranha 12-kW plate laser cutter to provide high-quality, versatile parts and services at the fastest rate possible. “We are a cutting-edge company, and this is a cutting-edge machine,” Myers notes. SC2 uses the Piranha 12-kW laser cutter for all different types and thicknesses of materials. The 12-kW laser filled SC2’s expanded shops’ need for more hours and more time to be able to push through a great deal more work. SC2 loads large-size plate onto its 12-kW laser cutter. The efficiency of the 12-kW laser has proven to significantly improve production velocities and quality compared to machines previously used. SC2 also appreciates the ease of use of the new laser, resulting in the reduction of labor costs per part. Presently, SC2 doesn’t use automation for loading and unloading the 12 kW, although it may be considered in the future. The laser runs with at least two operators, depending on the types of parts and the length of the production run. For service and parts, Piranha is conveniently located only two hours away from SC2, another not-to-be-overlooked reason for choosing the 12-kW laser. SC2 appreciates the ease of use of the 12-kW laser cutter, which allows the company to train operators much more quickly. 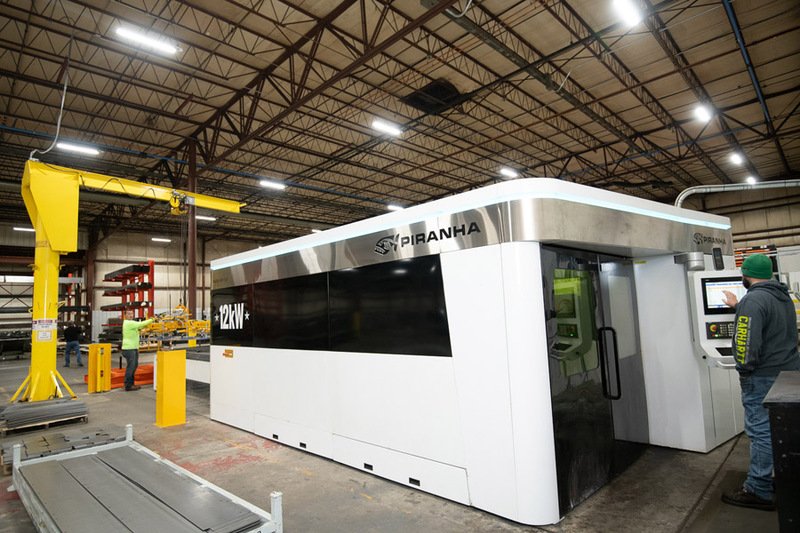 According to Dale Bartholomew, sales manager for Piranha, the 12-kW laser is a sealed unit that uses a reflective cutting head to handle 12 kW of power. 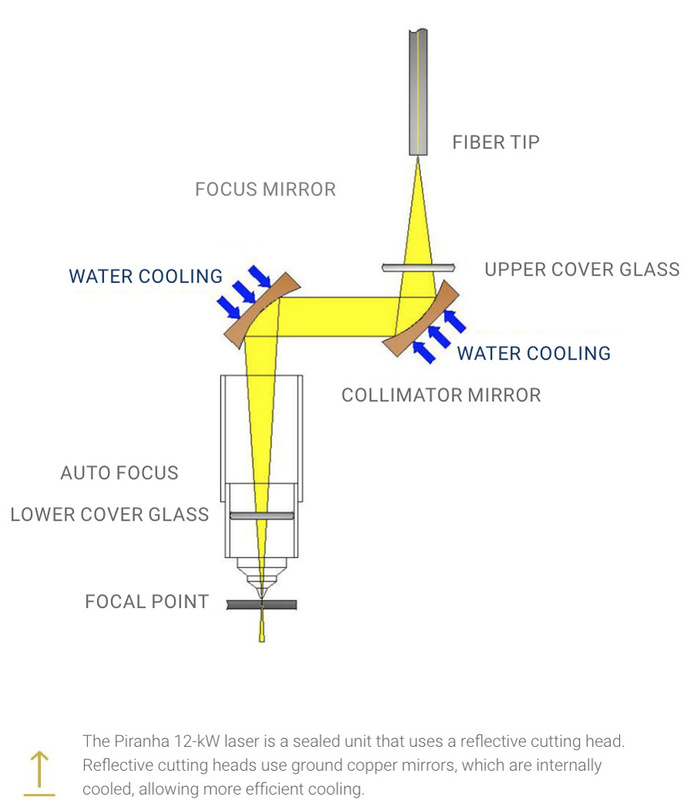 Reflective cutting heads use ground copper mirrors to replace the collimating and focusing lenses. The mirrors are internally cooled, allowing more efficient cooling that eliminates potential hot spots from contamination. With direct cooling, the mirror surface does not thermally distort. Transmissive optics, on the other hand, use lenses instead of mirrors. Lenses are cooled from the edges yet the beam goes through the center of the lens. When using high power – 6 kW and above – even the slightest contamination within the beam path lens creates a hot spot, causing distortion of the lens and a resulting shift in the focal point. This, in turn, yields unacceptable cut quality or cutting head failure. Piranha cutting heads feature built-in sensors to monitor temperature in all critical areas. This monitor, which is integrated into the CNC, monitors temperatures and stops cutting if the temperatures reach predefined levels. Additionally, Piranha uses material parameter libraries (MPLs) built into the CNC. The MPLs control everything from pierce cycles to complex contouring geometries. To change material type and thickness only requires changing the reference to the MPL. These features help maintain consistency from programmer to programmer and operator to operator because there are no databases connecting separate workstations. Another big advantage of the laser cutter is its ability to use nitrogen to cut steel plate up to 1/2 in. thick. Cutting with nitrogen eliminates the oxidized edge that occurs when cutting with oxygen. To further aid in nitrogen cutting, Piranha developed a cutting gas system that reduces the amount of nitrogen required when cutting with 12 kW in thick plate. When cutting thick plate, piercing through the material can require a lot of time. 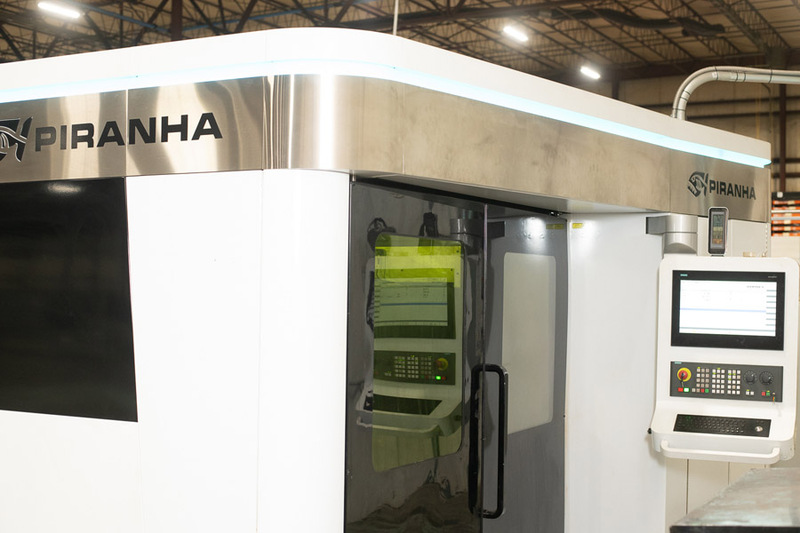 Piranha’s fiber laser rapid pierce cycle minimizes the amount of heat and minimizes the time required to get the laser beam through the material before cutting. SC2 typically runs the 12 kW with at least two operators, depending on the types of parts and the length of the production run, so as to not “starve” the machine. Traditionally, there are two ways to pierce thick plate with the laser. One is to blast through with as much power as possible. This puts a lot of molten material on the surface of the plate and can compromise the cutting nozzles and cover slides. The other way to pierce thick plate is to put low power into the plate for long periods of time. This can take up to 15 sec on 1-in. plate, which injects a lot of heat into the material. Piranha’s system can pierce 1-in. plate in approximately 2 sec. and 3/4-in. plate in approximately 0.8 sec. In this scenario, the heat goes into the ejected material instead of the plate. This means the laser can cut immediately after piercing. Finally, Piranha uses polymer granite instead of steel for the machine base because it’s more rigid and heavier than steel and not susceptible to thermal changes. Instead of rack-and-pinion drive systems, Piranha uses linear drive motors throughout. Linear drive motors provide faster acceleration and faster positioning speeds and lower maintenance requirements. The machines are more reliable and stable at the high speeds and high accelerations the 12-kW laser achieves. It’s 100 percent employee ownership that has driven SC2’s success and longevity. The Employee Stock Ownership Plan (ESOP) is a government regulated program that provides company stock and direct ownership benefits to its employees.